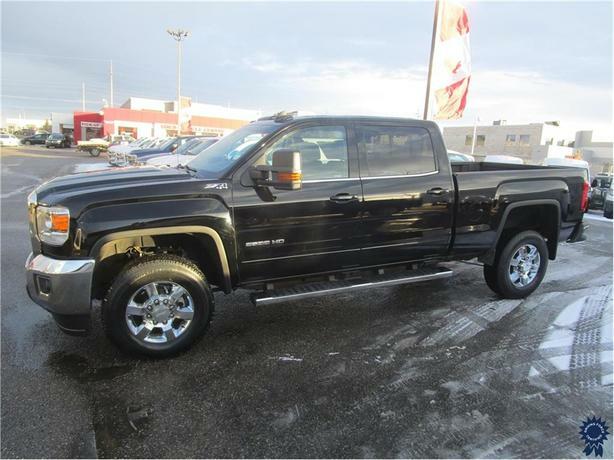 This 2018 GMC Sierra 2500HD SLE Z71 Crew Cab 6 Passenger 4X4 6.6-Foot Medium Box Truck comes with a 153.7-inch wheelbase, 6-speed automatic heavy-duty electronically controlled transmission, 4.10 rear axle ratio, 18-inch chrome aluminum wheels, front 40/20/40 split bench seat, cloth seat trim, 8-inch Diagonal Color Touch Screen with GMC Infotainment System, backup camera, AM/FM/SiriusXM satellite capable radio, 6-speaker audio system, Bluetooth for phone connectivity, remote engine start, engine block heater, 150-amp alternator, deep tinted glass, remote locking tailgate, integrated trailer brake controller, heavy-duty locking rear differential, power door locks, tow-style mirrors, remote keyless entry, single-zone air-conditioning, steering wheel-mounted cruise control, manual tilt-wheel steering column, tire pressure monitoring system with fill tire alert, spray-in bedliner, integrated trailer brake controller, Apple CarPlay/Android Auto, factory-installed 6-inch chrome side steps, fog lights, WiFi hotspot, balance of GM warranty, a 120 point vehicle certification, clean CarFax vehicle history report, and GWVR rating of 9,500 lbs (4,309 kgs). The Vortec 6.0-litre V8 gas engine provides 360 horsepower at 5,400 RPM and 380 lb-ft of torque at 4,200 RPM. Touch base with us to discuss purchasing or financing options that are right for you and experience the difference you will only find at DRIVING FORCE Vehicle Rentals, Sales and Leasing.